A sign on a buffer between the road and one of our fields. Follow The Z Spread Farm blog at https://barefootonthefurrows.com/ or on Facebook facebook.com/thezspreadltd. We are over the moon with feelings of accomplishment and glad that inspection was early in the season. Now we can focus on haying and all the plowdown we have yet to do. I’m looking forward to some more long days in the tractor, far away from paperwork. We didn’t spend quite as many hours on organic books this year, and I think that means we are getting the hang of things on that front. In fact (commence some pompous bragging), the inspector said our farm records were the best he’s ever seen! I was soooo glad to hear this, since it is one of the tasks that I stress most about, and I spent a good 20 hours or so working on paperwork before he came. For readers who are new to organic methods, I thought I’d summarize what is involved in the yearly organic inspection so that we can maintain certification. We usually get a call from an organic inspector from AOPA (the Alberta Organic Producers Association) anywhere from two weeks to a month or so before the inspection date. In that period, we knock off an incredible to-do list, making sure everything is just right. One job before inspection happens is double checking that all our “Do Not Spray” signs are up on our buffers. This is so neighbours are aware of drift when spraying, and so the county doesn’t accidentally spray ditches next to our fields. 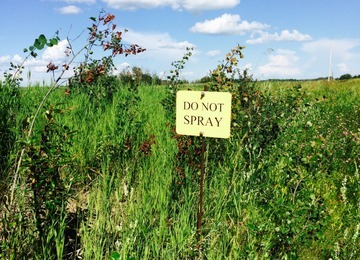 We have an agreement with Birch Hills County that they don’t spray near our fields, but signs are just an extra precaution. We are lucky to live where we do, since most of our fields are surrounded by trees, this task isn’t as big as it might be for organic farmers in less-treed areas. Another task is to make sure we can access all the fields so we can show the inspector the crops. This year we found this a bit of a challenge, since we are still cleaning up fallen trees from a snowstorm in May, and have to fix the river crossing since we got a ton of rain in June and the river was very high. As it was, we didn’t get to everything this year and we ended up taking the inspector to see the last field on quads across the river and over some trees. I was a bit nervous about this, but I don’t think he minded – I looked back a few times to see him grinning as he drove over trees with the quad. I guess a scenic quad ride is nothing to complain about. The biggest job to do before inspection is updating the Organic System Plan (OSP). We send in an annual update at the end of February every year, with our proposed seeding plan, rotation, and our total inventory and sales from the time of the last inspection. Just before the inspector comes, we go over this form in depth and make notes on any changes from our original seeding plan. This year for example, we had originally planned to plant winter wheat on our lease across the river, however with the dry spring that we had were were able to get on that field much earlier than usual so we decided to plant flax instead. Flax has a longer growing season than wheat and we usually never are able to plant flax on that particular field because we can’t cross the river early enough. It’s good we got to it, because it will add more variety to the crop rotation. One of the last things we do before inspection date is make sure that the house and yard are well-kept and beautiful. This isn’t a necessity for inspection, but moreso a necessity for our sanity, I think. When inspection is over and we’re finally done worrying about it, then we can take a guilt-free evening off to celebrate without seeing a huge to-do list of yard and house maintenance. When the inspector arrives, we usually go over the paperwork first. He or she checks for changes to the original seeding plan, and will ask to see a seed source list for where the seed for each crop planted this year is coming from. We usually use our own seed, so this is often covered with our bin and field records. However if we purchase any grain for seed then we also need to have some extra forms ready – like organic certificates, and proof that it’s untreated, non-GMO seed. This year we are purchasing some winter wheat, so I had to fill out a “Non-GMO Affidavit” form for the first time. It’s fairly straightforward, but definitely not something that I would ever want to overlook for inspection. Proof that our seed reaches organic standards is extremely important. The inspector will also want to see bin records (what is in each bin and where it came from), field activity (what we did on each field and when), and clean equipment logs (anytime a piece of equipment was washed or blown off), etc.. He or she will also do a sales audit trail for a randomly chosen certified organic sale since the time of the last inspection. This starts with making sure that the grain was hauled with a clean truck. Most trucking companies haul both organic and conventional seed, so we have to inspect any truck that comes before loading it, to make sure it has been properly washed and there’s no chance of contamination. The next things to check is what bins the truck was loaded from, and then what fields the grain in those bins came from. The inspector has to make sure that every certified organic sale is traceable from field to buyer, so any time we move grain, dry grain, clean grain, or harvest multiple fields into the same bin, it all must be recorded. When the paperwork is all done, we get to do the fun stuff – taking the inspector for a tour of the yard and fields. We usually start with the grain bins, to check that the bin inventory matches up properly, and then go for a drive. During the tour, the inspector will take notes making sure that each field is seeded to what our records say, and also will check buffer zones to make sure they are wide enough to protect our organic crops from any spray drift from the conventional fields nearby. This year’s tour was very enjoyable since our inspector was so enthusiastic, he even said our crops are the best he’s seen this year so far! We are pretty pleased with them too, the rain was timed perfectly with our seeding this year and some of our rotation decisions are working out great! Everything is a beautiful deep green, which means there’s lots of nitrogen in soil. Things are also maturing early, which means a nice early harvest!